"Boys and girls, this is a cinder block." The Goon has always been characterized as thoughtful and calculating. Sure, he's got beastly strength, but he carefully weighs his options before just jumping in. Sometimes though, the brawn beats the brains and in The Goon: Once Upon a Hard Time #1 from Dark Horse, The Goon is relying purely on muscle to get answers to his questions. The issue is written and illustrated by Eric Powell. After the tragic events of Occasion of Revenge, the witch coven believes that control of the unnamed town will soon be in their grasp and the Goon’s tragic soul will contribute to the curse that increases their power. But has their plot destroyed the Goon or created a monster too savage for them to withstand? The Goon: Once Upon a Hard Time #1 features The Goon as essentially an emotional bulldozer laying waste to anything and anyone in his path. He's determined to find the answers he's searching for, even if it means nearly destroying everything in his path. In this regard, Powell does an exceptional job with the character, maximizing his physical capabilities to pummel his problems into submission. What makes his actions much more frightening is Powell gives The Goon some purpose in his violence and even though his actions seem haphazard they're actually very calculated. The fact that Powell puts The Goon in a state of mind that not only scares his opponents but his friends too is extremely powerful and terrifying. Fitting with the noir narrative, Powell's art has always relied on grays and a clean look. The Goon: Once Upon a Hard Time #1 is no exception, yet here Powell manages to make the book feel even darker. It likely has to do with all the instances of The Goon pummeling a source to get information, but from a broader perspective Powell illustrates The Goon just plain angry. The emotion on the faces of the characters reflect that as well; from the obvious scowl The Goon sports to the looks of concern and fear on the faces of those around him. The encounter with a familiar foe gives Powell the chance to branch out a little bit in terms of colors and look, but the emotional impact of the panels are just as violent as some of the preceding ones. The Goon: Once Upon a Hard Time #1 is a very dark, angry issue, even for the series that it's a part of. The Goon is on a rampage and is giving no thoughts at all to the collateral damage his actions will cause. Powell's story is dripping with revenge and it's something that gives The Goon enough motivation to inflict pain on any and all comers. The illustrations of said anger are even more powerful and really hammer home the emotional state The Goon is in as he pursues his somewhat reckless agenda. The Goon: Once Upon a Hard Time #1 doesn't boast any cheerfulness at all really, unless you find joy in a character taking out his anger on any and all opponents in the name of presumably love. 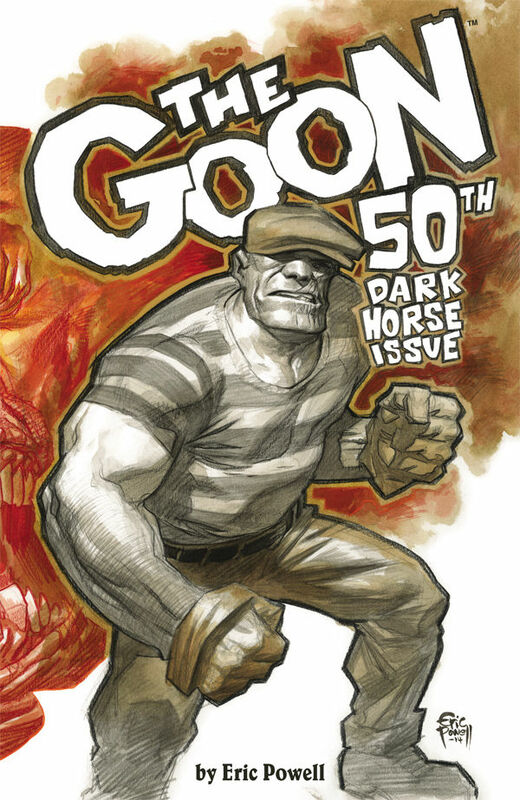 The Goon: Once Upon a Hard Time #1 is in stores February 4.